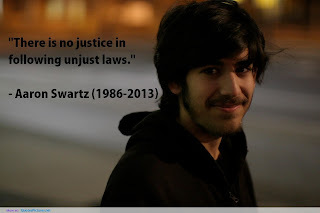 Aaron Swartz was a brilliant, young mind who had some incredible accomplishments in this short life. He helped write the RSS 1.0 specification, unofficially co-founded Reddit, and worked feverishly as an activist for the freedom of information. Sadly, mainstream media made him notorious for using the MIT network to hack into the non-profit JSTOR and "liberating" millions of scientific and academic papers. He subsequently returned the papers to JSTOR, who sought not to pursue him and actually changed their rules to open access to their research. But he was still charged with 13 counts of network and computer fraud-related offenses, punishable with up to 35 years in prison and $1 Million in fines. A little more than a week ago, Aaron committed suicide, cutting short his brilliant existence and leaving the tech world reeling. Since then, there have been a number of projects memorializing Aaron, including an MP3 project and a KickStarter to fund a documentary about his life. Well, not only was the KickStarter successful, the film is done and will soon be out in theatres. Here's the trailer. I can't wait to see it. A fantastic-looking tribute to such a short, impactful life. Find out more about the Aaron Swartz Documentary.